I was born one day after Alexei Leonov's spacewalk, at the height of the space race. My earliest memories are associated with a blurred image of man on the moon and since then I've been attracted by astronomy and space exploration,especially Apollo. Although I work for ADIF, a public company that manages railway infrastructure in Spain, as a hobby I run an Astronomy Workshop in the Foula Cultural Association (Ourense, Spain), specializing in planetary science. In preparation for the 40th anniversary of Apollo 11, my wife, Elena, our children Alvaro and Gabriel, and I organized an exhibition called Apollo Lunar Exploration. I am currently developing multimedia material for the lunar section and for the planetary section, collaborating with UNAWE (Spain) in the popularization of astronomy in childhood. As a family, we engage in two activities closely related to space exploration: diving and caving. Both activities - as well as our passion for the volcanos - allow us to have lunar-like experiences. ALSJ gives the possibility of research in original sources otherwise unattainable and allows us to relive the excitement of exploration. Each time we query the Journal, we are with the astronauts on the Moon! 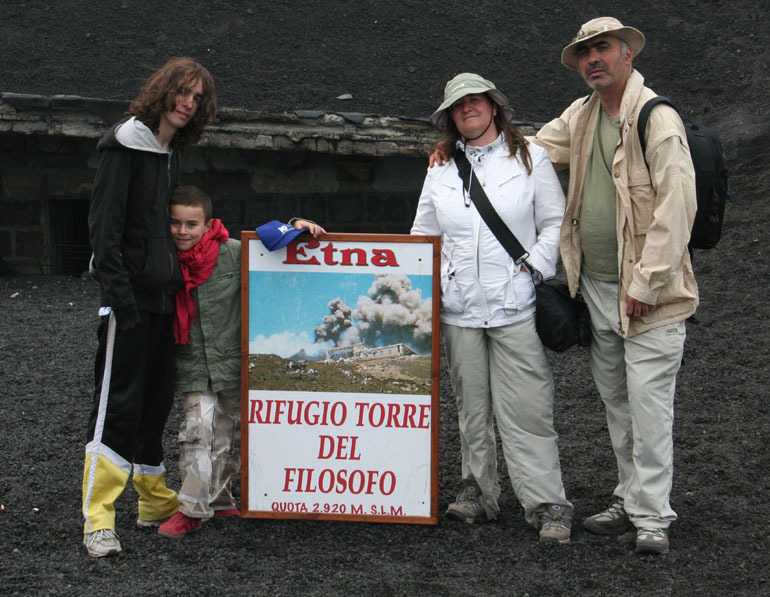 in front of the refuge at the Torre del Filosofo (Philospher's Tower) on Mt. Etna in Sicily. buried in pyroclastic debris in the 2002-03 eruption.